I always welcome new ideas to entice cats to eat raw for the first time if all other suggestion from our brochure fails. 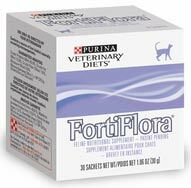 Feline Forflora by Purina is a new enticement discovered by a few customers. Please use just enough to get the cat to eat because to much will cause diarrhea. Also, one customer raved about how great grated Parmesan cheese worked for her one kitty that refused raw all together.